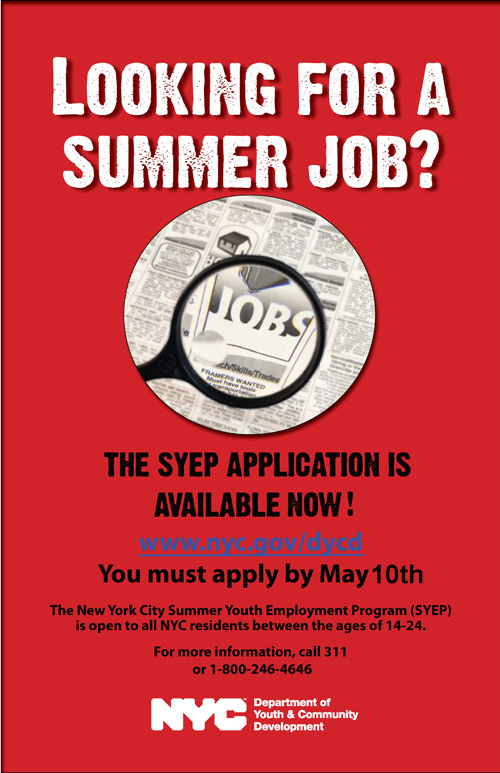 The Summer Youth Employment Program (SYEP) is a six-week program open to all NYC residents between the ages of 14-24 – and the application is available now. We highly encourage District 8 youth to apply to SYEP because of the one-of-a-kind work experience they can receive in a variety of jobs, ranging from government agencies, community-based organizations, private sector businesses and more. Last summer, DYCD employed around 30,000 teenagers and young adults and placed them at 5,677 work-sites. Click here to download the paper application in PDF; and if you have questions, you can download the 2013 SYEP FAQ here as a PDF. This entry was posted in Blog, Citywide, Opportunities and tagged DYCD, employment, NYC, Summer Youth Employment Program, SYEP, youth. Bookmark the permalink.